The latest U.S. Department of Agriculture (USDA) cotton projections for 2016/17 indicate that world cotton mill use is forecast to rise for the fifth consecutive season. Global cotton consumption is projected at 111.6 million bales (of 480 pounds) in 2016/17, 1.3 percent higher than 2015/16 and 7 percent above the recent low of 2011/12, when world prices averaged near $1 per pound. China is the leading spinner of raw cotton, accounting for over 30 percent of the total. However, recent mill use growth has shifted among countries as relative spinning costs affect consumption patterns. With 2013/14 as the base year, 2016/17 global cotton mill use is projected to rise less than 2 percent, as growth among the largest spinners—China, India, and Pakistan—has been limited (fig. 1). In contrast, cotton mill use has grown appreciably in a couple of countries. In Bangladesh, 2016/17 mill use is expected to be 13 percent above the 2013/14 level. Even more remarkable, however, has been the recent growth seen in Vietnam, with 2016/17 mill use projected to be more than 50 percent above 2013/14. The 2016 U.S. cotton crop is projected at 15.8 million bales, 7 percent (1 million bales) above the June projection and 23 percent higher than the 2015 crop. 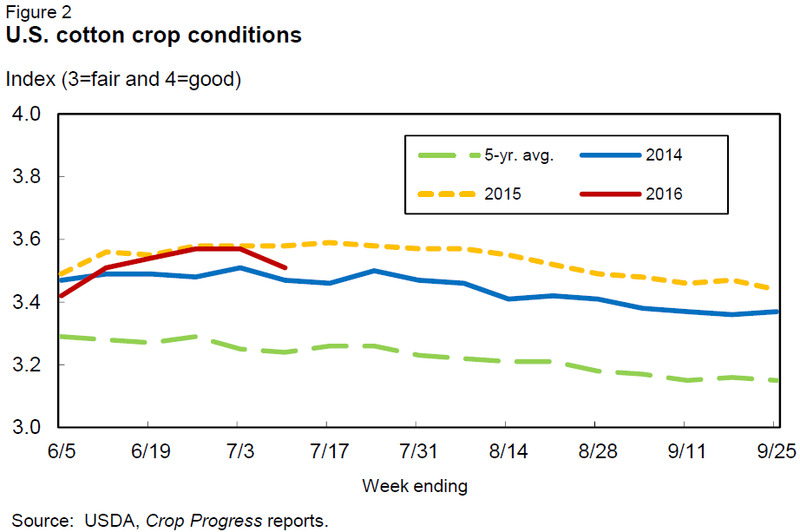 The July production increase was largely attributable to the higher planted area reported in the June Acreage report; favorable moisture conditions in the Southwest region also contributed to the larger crop projection as reduced abandonment and higher yields were estimated. Based on the Acreage report, U.S. producers indicated that they had planted or intended to plant 10 million acres to cotton in 2016, 5 percent above the March indications and 17 percent above 2015, a year when excessive rainfall kept plantings from reaching initial expectations (see table 10). Upland cotton area projections for 2016 increased for each of the Cotton Belt regions, as expected returns for cotton—compared with those for alternatives— encouraged higher plantings this spring. Area in the Southwest is reported at 5.8 million acres, 16 percent higher than 2015 but still 10 percent below the recent 5- year average. Southwest upland acreage is expected to account for about 60 percent of the U.S. area in 2016, similar to the previous three seasons. In the Southeast, cotton area is estimated at 2.3 million acres, slightly above 2015, but one of the lowest levels this decade. Area in the Delta is forecast to rebound to 1.5 million acres in 2016 from the previous season’s historic low of only 985,000 acres; Delta area is expected to account for 16 percent of U.S. acreage in 2016. Similarly, upland cotton area in the West is projected to rise from the smallest in nearly a century; in 2016, upland acreage is estimated at 205,000 acres, or 2 percent of the U.S. upland total. In addition, extra-long staple (ELS) cotton acreage is grown predominantly in the West. Total ELS area for 2016 is projected at 199,000 acres, 26 percent (40,000 acres) higher than 2015. Total cotton harvested acreage is estimated at 9.3 million acres in July. U.S.
abandonment—forecast at 7 percent—is based on the 10-year average abandonment by region, with the Southwest estimated at 10 percent to reflect favorable moisture conditions. The U.S. yield is projected at 815 pounds per harvested acre, compared with 2015’s 766 pounds per acre and a 5-year average of 820 pounds. Yield expectations are based on 3-year average yields by region, with the Southwest adjusted upward to reflect the favorable conditions. In August, USDA’s National Agricultural Statistics Service (NASS) will publish its first survey-based results for cotton production in 2016. U.S. cotton crop development as of July 10 indicates that 57 percent of the 2016 cotton crop was squaring, equal to last season but 5 percentage points below the 2011-15 average. In addition, area setting bolls had reached 19 percent by July 10, compared with 16 percent in 2015 but equal to the 5-year average. Rainfall early this season has benefitted the cotton crop, with U.S. conditions similar to the previous 2 seasons (fig. 2). As of July 10, 54 percent of the U.S. cotton area was rated “good” or “ excellent,” compared with 57 percent a year earlier, while 11 percent was rated “poor” or “very poor,” compared with 8 percent in 2015. U.S. cotton demand and stocks for both 2015/16 and 2016/17 were revised in July. For 2015/16, U.S. cotton exports are forecast at 9.2 million bales; although 200,000 bales higher this month—due to shipments through the end of June that were stronger than previously anticipated—exports remain at their lowest since 2000/01, as the reduced 2015 U.S. crop pushed supplies to their lowest since 1984/85. Consequently, the U.S. share of world trade is projected at 27 percent, down from 2014/15’s 32 percent. For 2016/17, U.S. cotton demand was raised 1 million bales to 15.1 million, the highest in 4 years. U.S. exports were responsible for the entire increase as U.S. cotton mill use remains estimated at 3.6 million bales in 2016/17. Contributing to the export rebound are a larger supply based on increased U.S. production and the reduced 2016/17 foreign crop projection that is at its lowest since 2003/04. U.S. cotton exports in 2016/17 are projected at 11.5 million bales. With global trade only slightly higher in 2016/17, the U.S. share of world trade is expected to expand to 33.5 percent, the highest in six seasons. Based on the latest supply and demand estimates, 2016/17 ending stocks are forecast at 4.6 million bales, up from 2015/16’s 3.9 million bales and the highest level since 2008/09, when stocks were over 6 million bales. However, relative to demand, stocks in 2016/17 are expected to be similar to 2015/16, with a stocks-touse ratio of 30.5 percent. As a result, the 2016/17 upland cotton farm price is expected to range between 52 and 66 cents per pound, with the 59-cent midpoint slightly above the 58 cents per pound estimated for 2015/16. Global 2016/17 cotton production is projected at 102.5 million bales, about 5 percent (4.6 million bales) above 2015/16. Despite the increase, output in 2016/17 is expected to remain the second lowest since 2003/04. For 2016/17, production increases are noted for most cotton producers—except China—as yields rebound from a disappointing 2015/16 season. With favorable crop alternatives, global cotton harvested area in 2016/17 is forecast at 30.2 million hectares (74.5 million acres), 400,000 hectares (1 percent) below the previous season. The world cotton yield is estimated at 740 kilograms/hectare (660 pounds per acre) in 2016/17, 3 percent below the 5-year average. 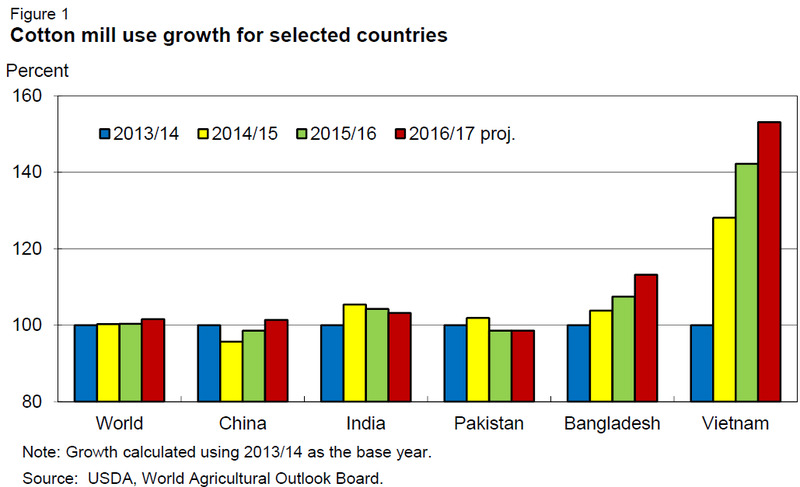 World cotton production concentration continues among a handful of countries (fig. 3). In 2016/17, the top five cotton-producing countries are forecast to account for a combined 77 percent of global production, similar to 2015/16 but slightly lower than the average for 2012/13-2014/15. 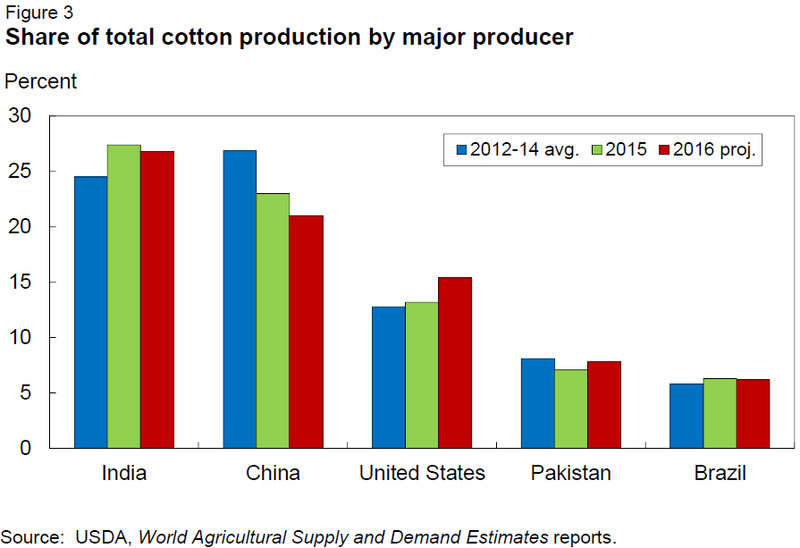 India and China (the largest cotton producers) together account for nearly half of the global cotton crop. In 2016/17, India is forecast to produce 27.5 million bales of cotton. While lower area is anticipated, a return to average yields is projected to push India’s crop 700,000 bales above 2015/16; India’s share of global production is estimated at nearly 27 percent. For China, 2016/17 cotton production is projected to decline 1 million bales (nearly 4.5 percent) to 21.5 million, contributing 21 percent of world production. Area devoted to cotton in China continues to decline and, at 2.9 million hectares in 2016/17, is at historically low levels. Estimates of world cotton consumption for 2015/16 and 2016/17 were raised in July, continuing the slow recovery in global cotton mill use over the last several years. For 2015/16, global cotton mill use is now projected at 110.2 million bales, 1.4 million bales above the June estimate and marginally higher than 2014/15. The July gain was attributable to a 1.5-million-bale increase for China, where consumption is now estimated at 34 million bales; a slowdown in China’s cotton yarn imports coupled with the recent strong sales of China’s reserve stocks indicate that mills are consuming more cotton than previously estimated. For 2016/17, July’s world consumption projection is placed at 111.6 million bales, 1 million bales higher than the June forecast. The global increase resulted from a 1.5-million-bale increase in projected consumption for China that paralleled the 2015/16 increase; however, offsetting this gain somewhat were July decreases for India and Pakistan, countries that supply cotton yarn to China. Mill use in China is now forecast to reach 35 million bales during 2016/17, the highest in 4 years. India’s consumption is projected at 24 million bales, down slightly from 2015/16, while mill use in Pakistan is unchanged from 2015/16 at 10.25 million bales. Meanwhile, 2016/17 cotton consumption is expected to expand in Turkey (+1 percent), Bangladesh (+5 percent), and Vietnam (+8 percent). Global ending stocks are forecast at 91.3 million bales for 2016/17, a 9-percent (9- million-bale) reduction from 2015/16, as world consumption exceeds production for the second consecutive season. While China continues to hold the majority of global cotton supplies, stocks in China are projected to decline 9 million bales (15 percent) to 51.7 million bales in 2016/17; this follows a 7-million-bale reduction in 2015/16. Current policies in China are expected to reduce stocks further in subsequent seasons. In 2016/17, China is forecast to hold 57 percent of the global stock total, compared with more than 60 percent during the previous three seasons. Year-to-year changes in projected 2016/17 stocks for countries outside of China are about offsetting. While stocks are expected to rise in the United States and India, lower stocks are forecast for Brazil and Pakistan. The global stocks-to-use ratio is projected to fall 9 percentage points to 82 percent by the end of 2016/17, the lowest since 2011/12. Consequently, world cotton prices (A Index) are expected to increase slightly from 2015/16’s estimate of 70 cents per pound. USDA has raised its 2015/16 estimate of China cotton consumption and its 2016/17 forecast. A 3-percent year-to-year increase in consumption is now foreseen for 2015/16 instead of a decline, the first increase in consumption since 2009/10. Continued consumption growth in 2016/17 also is expected, but at a marginally slower rate, as China continues cycling cotton out of its National Reserve at competitive prices and demand for China’s textile exports remains relatively robust. China began reforming its policies for supporting cotton farmers in 2015, reducing the premium paid for cotton in China relative to the outside world and starting to reduce government-owned stocks of cotton from the unprecedented level reached in 2014/15. 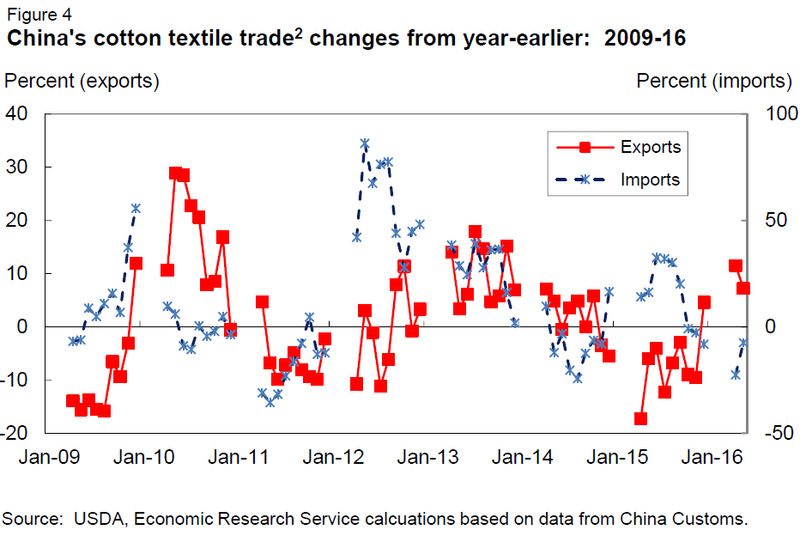 During most of 2015, China’s cotton textile trade surplus deteriorated as exports shrank and imports rose (fig. 4). However, since December 2015, a new textile trade pattern appears to have emerged, with imports (primarily yarn) contracting and exports (primarily clothing) expanding. This suggests cotton consumption rose in China during 2015/16. While only about half of China’s cotton spinning is destined for exported products,1 the competitive forces that first discouraged and then encouraged China’s net exports of cotton products also influenced demand within China to some degree. Trends in textile trade are not the only evidence of rising consumption in China. Cotton prices have risen strongly in China since near the initiation of the 2016 reserve selling program—with Zhengzhou futures rising from around 10,000 Renminbi (RMB)/ton to nearly 15,000 RMB/ton—and demand from mills for cotton from the reserve has been very robust. Virtually all of the cotton offered for sale from the reserve has been purchased in every week of the reserve selling campaign that began in May. Between China’s December 2001 accession to the World Trade Organization (WTO) and the end of 2007, China’s cotton textile imports and exports appeared to be following parallel trends. Growth rates were trending down, with import growth rates slipping into negative territory, and net cotton textile exports appeared to be on a strong upward trend. The onset of the Great Recession and the introduction of a high level of domestic price support for cotton in China brought a period of volatility to China’s cotton textile trade, with exports realizing significant negative growth first as the world economy contracted in 2009, and then again as high domestic price supports reduced the competitiveness of China’s cotton spinners in 2011 and 2012. Import growth leapt to unprecedented highs in 2012 as yarn poured into China from around the world. In the long run, China’s demographics and significant success in raising wages since its WTO accession are expected to erode China’s ability to maintain its position as the world’s leading textile exporter. But there are many factors that suggest the erosion will not be precipitous. China’s superior physical and institutional infrastructure significantly reduces the time needed to deliver apparel, and rising wages will have less impact on the capital-intensive yarn producing segment of the supply chain than on the final labor-intensive clothing assembly portion. China’s role as a supplier of fabric to other clothing exporting countries is likely to persist even as its preeminence in clothing exports begins to wane. In the short run, the transition from a period when China’s textile mills were hampered by a lack of access to competitively-priced cotton to the current phase means China can reduce its yarn imports and more actively compete for export sales of fabric and clothing. Analysis of trends in China’s textile trade is hampered by annual variation in the timing of China’s Spring Festival or New Year, but year-to-year comparisons of both imports and exports for recent months other than January-March suggest China’s net textile exports are again on an upward path. Gains in exports for December 2015, April 2016, and May 2016 from a year earlier were 5, 12, and 7 percent, respectively. Imports contracted 8, 23, and 7 percent from the year before in those months. It is possible that these gains were exaggerated by the poor performance of trade during the year before, but the combination of robust textile export performance with strong demand for cotton from China’s National Reserve and rising cotton prices suggests that a 3-percent annual rate of cotton consumption growth in China in 2015/16 and 2016/17 is likely. Recent developments have renewed the access of China’s significant textile infrastructure to competitively priced raw material, resulting in increased efficiencies for global consumption of cotton. China’s capacity for producing and delivering textiles is far superior to that of many other countries, facilitating the delivery of a greater volume of final product. As a result, world textile markets can potentially support an increase in China’s cotton consumption larger than the decrease in consumption elsewhere due to reduced yarn sales to China.